Highest quality and fully featured MySQL to MS Access Database Converter Software converts database records created in My SQL format to popularly used Microsoft Access database in simplified and easiest way. Now no need to refer experts for database conversion process, simply use easy to operate data base converter program and get converted entire or selected MySQL database records in few mouse clicks. Database Migration Tool provides support to all null value constraints, key constraints, data types, schemas, attributes, tables (rows and columns) during database conversion process. The database converter utility allows its users to overwrite the records of existing database records with the converted database records or save the converted database records on the disk at user specified location for future purposes. 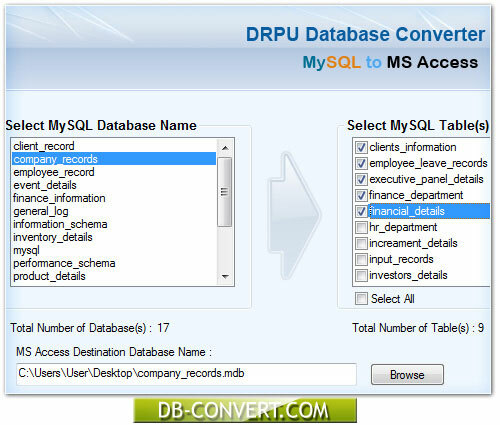 Database Conversion tool converts the database records created in MySQL to MS Access database format with full accuracy. Convert selected individual tables or entire MySQL Database records. Provide advance feature of overwriting the existing MySQL database records or saves the converted database at user specified location. Work with all versions of Windows MS Access. Easily convert password protected MySQL Database. Saves time by automatically converting the single or multiple database records from MySQL database format to MS Access database format. Saves money as the database converter utility proves to be cost-effective database converter as compared with all available complex and highly-priced alternatives. Support all major versions of both MySQL to MS Access.